If you launch a Microsoft Office application (Word, Excel, PowerPoint,) on Mac OS X, you may receive a prompt about launching a Microsoft AU Daemon for the first time. You are opening the application “Microsoft AU Daemon” for the first time. Are you sure you want to open this application? The application is in a folder named “MacOS”. To see the application in the Finder without opening it, click Show Application. The Microsoft AU Daemon application query’s Microsoft servers for updates and validates your Office product key. If you do not wish to open this application and want to stop receiving the prompt each time you open an Office application, follow the steps below. When you receive the prompt for You are opening the application Microsoft AU Daemon click Show Application. You can also browse to the application location below. Right-click Microsoft AutoUpdate.app and select Show Package Contents. 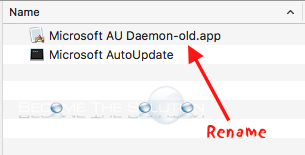 Rename Microsoft AU Daemon.app to Microsoft AU Daemon-old.app pictured below. You will receive a prompt about changing the name while Word is open, this is ok. You will also receive a prompt to enter your account password. After successfully changing the name of the app in step 4, reboot your Mac. Validate the next time you open an Office application you no longer receive the You are opening the application “Microsoft AU Daemon” for the first time message. Much thanks for useful guidance! It's work now!